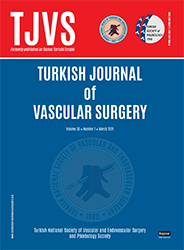 2Department of Cardiovascular Surgery, Private Megapark Hastanesi, Kahramanmaraş, Turkey DOI : 10.9739/tjvs.2018.18 Objectives: This study aims to compare the success rates of two different anastomotic techniques using Doppler ultrasound (US) in patients undergoing forearm arteriovenous fistula creation surgery for hemodialysis access. Patients and methods: Between January 2010 and March 2011, 40 patients (8 males, 32 females; mean age 52.7 years; range, 28 to 63 years) who underwent the forearm arteriovenous fistula procedure due to end-stage renal disease were included in this study. The patients were divided into two groups, depending on the surgical technique employed. Group 1 included 20 patients operated using the Brescia-Cimino technique, while Group 2 included 20 patients operated using the fish-mouth technique. The diameters of the radial artery and cephalic vein were measured pre- and at postoperative Days 1, 7, and 30. The arteriovenous fistula flow rate was measured using Doppler US at postoperative Day 30. Results: The mean preoperative cephalic vein diameters were 2.48±0.4 mm in Group 1 and 2.03±0.4 mm in Group 2 (p=0.004). The mean preoperative radial artery diameters were 2.46±0.5 mm in Group 1 and 2.04±0.2 mm in Group 2 (p=0.003). The mean arteriovenous fistula flow rates at Week 4 were 547±149 mL/min in Group 1 and 745±108 mL/min in Group 2 (p<0.001). Early complication rates and surgery times were lower in the fish-mouth group.